Sophomore forward Isaiah Gable looks to post up against Tennessee State in February. Southeast men’s basketball team defeated Tennessee State (89-74) in a clean fashion. 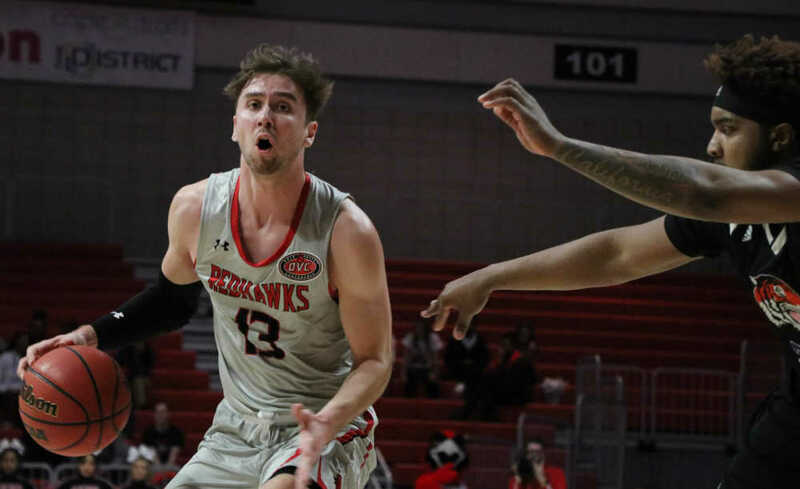 The Redhawks controlled the vast majority of the game as they never once dropped the lead, and ended the game with a total of five players in double figures in scoring. “We had 24 field goals and out of those 24 we assisted on 19 of them, and we reduced our turnovers,” Southeast coach Rick Ray said. The Redhawks also shot 73.7 percent from the three-point line in helping the team to its 10th victory of the season. Sophomore forward Isaiah Gable and sophomore guard Oscar Kao started the 3-point trend early for the Redhawks. This helped the team maintain the lead they've held the entire game, going into the first half up by 12 (46-34). “Offense has never been an issue. [Oscar] is a guy that really understands how to play basketball, he’s also starting to figure things out for us defensively,”Southeast coach Rick Ray said. “With Isaiah, that’s what we recruited him for to be a skilled four [forward] that can be a problem for the other team with the pick and pop situation,” Ray said about Gable. The team also closed the first half shooting 53.8 percent from the field opposed to TSU’s 42 percent and 30.8 percent from the 3-point line. Junior guard Michael Littlejohn finished the game with 18 points on 6-14 shooting from the field. The Tigers cut the 12-point deficit to eight points around the halfway mark of the second half, but their effort was not enough. Junior guard Skylar Hogan led the Redhawks with 15 points and six rebounds. “I just wanted us to play with a little bit of pride, especially for our outgoing seniors. We didn’t want to send them off the wrong way with our last two games at home,” Ray said. The Redhawks look to close out the final game of their season Saturday. March 2, at the Show Me Center against Belmont.